Closes in 13 h 12 min. 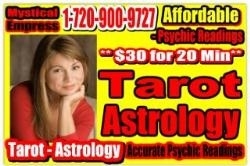 Affordable, accurate, psychic readings using empath, clairvoyant, tarot card, astrology, & numerology skills. Our most popular psychic readings consist of tarot card readings and astrology readings by phone as well as automatic writing readings by email. Be the first to write a review for Psychic Readings by Mystical Empress!